Gallia Academy senior Bailey Walker (44) hauls in a loose ball and leads a fast break during the first half of Saturday night’s boys basketball contest against River Valley in Centenary, Ohio. Gallia Academy senior Blaine Carter (11) releases a shot attempt over River Valley defender Jordan Lambert (20) during the first half of Saturday night’s boys basketball contest in Centenary, Ohio. CENTENARY, Ohio — The gap closed, but the result stayed the same. 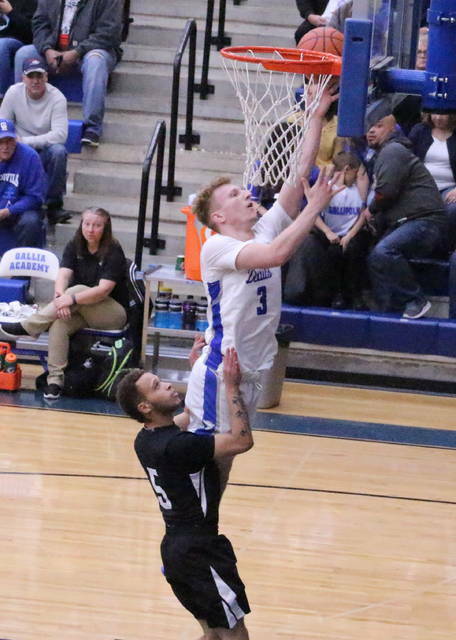 Visiting River Valley kept things competitive for 16 minutes, but an 18-8 third quarter surge ultimately allowed the Gallia Academy boys basketball team to pull away for a 53-37 victory on Saturday night in a non-conference battle between Gallia County programs. 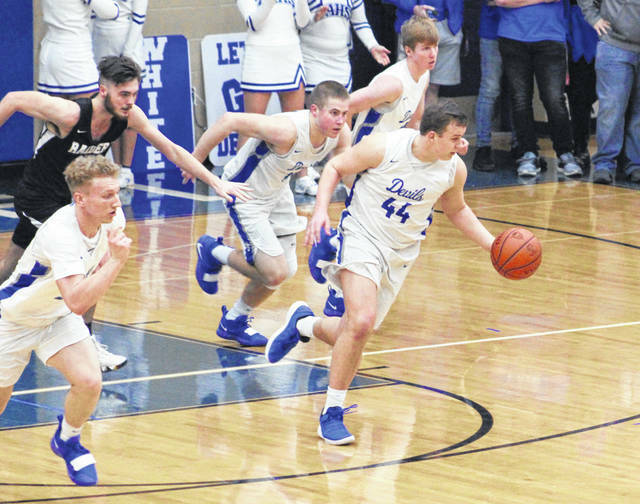 The Raiders (2-15) stormed out to an early 12-7 edge, but the host Blue Devils (10-7) countered with an 8-2 run over the final three minutes to secure a slim 15-14 advantage through eight minutes of play. The Blue and White ultimately never trailed again and made a quick 7-2 surge at the start of the second frame for a 22-16 lead, but RVHS answered with four straight points to close the deficit back down to a single possession. GAHS, however, responded with a pivotal 5-0 run over the final three-plus minutes that provided some breathing room headed into halftime with a 27-20 cushion. The Blue Devils rode that momentum into the third frame as the hosts netted 8-of-15 shot attempts as part of an 18-8 charge that ballooned the lead out to 45-28. The Silver and Black ended regulation with a 9-8 spurt to wrap up the 16-point outcome. 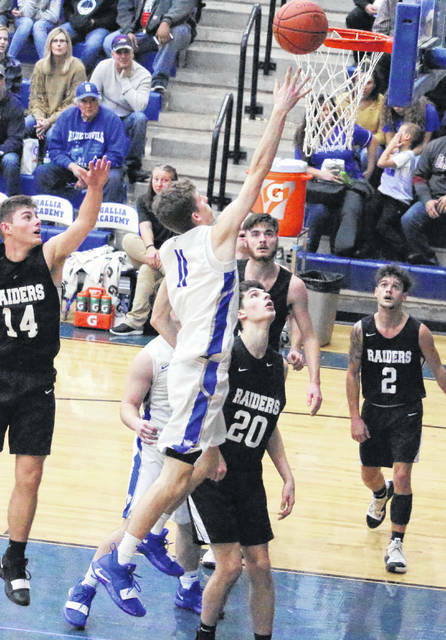 Gallia Academy claimed a season sweep of the Raiders after posting a 91-39 decision in Bidwell back on Dec. 4, 2018. GAHS coach Gary Harrison was pleased to see his troops pull away late and snap a three-game losing skid, but the sixth-year frontman was also impressed with the amount of improvement that River Valley has made since the first matchup. “I’ll tell you that I am really impressed with the job that Coach Bostic has done at River Valley since the first time we played them. They are so much better as a basketball team from two months ago,” Harrison said. “Honestly, we needed this one after dropping three in a row … and they made us work for every single drop of this victory. The Raiders — who have now dropped six straight — had a much better start of things Saturday than they did 24 hours earlier at Southern, when they trailed by 20 points at the break. All things considered, outside of the final result, first-year RVHS coach Brett Bostic was mostly pleased with his troops at the end of the night. Gallia Academy outrebounded the guests by a 29-15 overall margin, including a 14-1 edge on the offensive glass. The hosts also committed only 10 of the 31 turnovers in the contest. The Blue Devils netted 20-of-50 shot attempts for 40 percent, including a 5-of-19 effort from behind the arc for 26 percent. GAHS was also 8-of-10 at the free throw line for 80 percent. Cory Call paced the Blue and White with a game-high 22 points, followed by Caleb Henry and Blaine Carter with nine markers apiece. Call and Henry also led the hosts with eight rebounds apiece. Justin McClelland was next with seven points, while Bailey Walker and Ben Cox respectively added three and two points. Cole Davis completed the winning tally with a single point. The Raiders went 15-of-30 from the floor for 50 percent, but went just 2-of-15 from behind the arc for 13 percent. The guests were also 5-of-9 at the charity stripe for 56 percent. Jordan Lambert led River Valley with 18 points and six rebounds, followed by Brandon Call with 11 points and Rory Twyman with six markers. Layne Fitch completed the scoring with two points. Gallia Academy returns to action Tuesday when it travels to Proctorville for an OVC bout with Fairland at 6 p.m.
River Valley hosts Oak Hill on Tuesday in a non-conference tilt at 6 p.m.